Buy the Farm . . . Share: How Do You Like Them Apples? Tonight when I picked up the guys from day care Martin looked at me and became so elated that he began shaking all of his limbs and giving me the biggest smile I'd ever seen. It's pretty nice to see that reaction in someone. Elliott, on the other hand, gave me a look like I was seriously lacking. Somehow I disappointed him greatly. I guess he was expecting to get picked up by someone a lot cooler than his dear old dad. Tonight, we tried the Wombats on their first taste of apples. Martin was a very big fan. 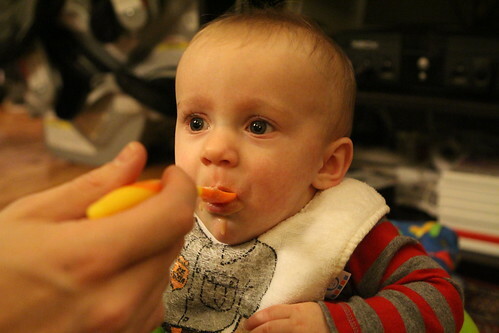 Elliott was hesitant at first because he was kind of acting like a weirdo. After some maneuvering he ate a healthy portion as well. It was one of their favorite foods so far. *Frozen. Will rank again fresh. 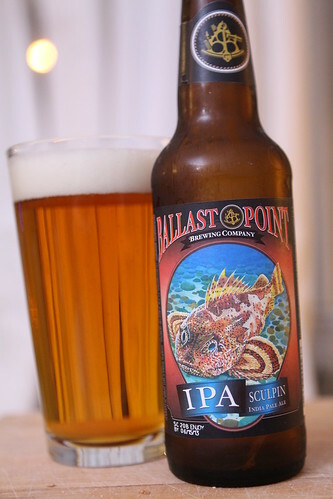 After finally wrangling the babies to bed we had a quick dinner including this Sculpin India Pale Ale from Ballast Point Brewing Company. I kept hearing great things about this beer. I've seen this around for years but I've never thought to try it given the picture of the big dumb fish on the label. It turns out it's a really, really good IPA for a very reasonable price. Who would have thought that after looking at that strange bottom-feeder on the label? Elliott has been having trouble staying asleep lately and seems to only want to sleep in bed snuggling with me. While this is fine by me I think it's probably best to break him of this habit. It will become particularly awkward when he starts to have sleepovers. Instead I took off my shirt and let him snuggle with that which seemed to knock him right out. It seems like bad parenting to put dirty laundry in the crib with your child but I like to take a "Whatever Works" type approach to parenting. Now I just need to figure out how I can get them to start doing the laundry. It's never to early to learn household chores! I'm hoping that Elliott was knocked out by the comforting scent of his dear old dad and not some sort of shirt funk! Did you notice that bananas snuck into the Favorote Food List?